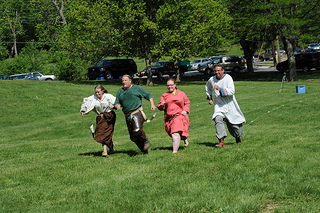 Many years ago, I was asked to run a 'highland games' at a local SCA event. 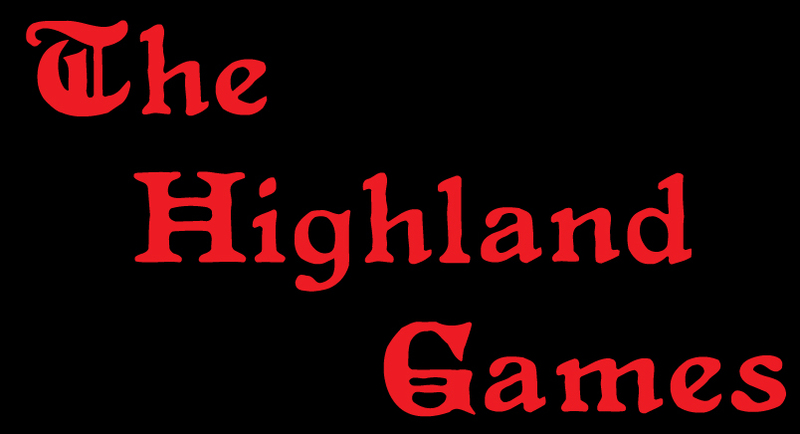 I was against the idea of running a traditional highland games, due to the very real possibility of injury to the untrained - which would be most of the contestants. Over the years, I added more games, dropped ones that didn't work as well, and came up with the current roster you find below. 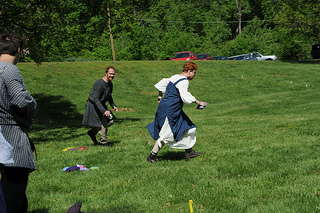 These games are designed to maximize silliness and enjoyment. 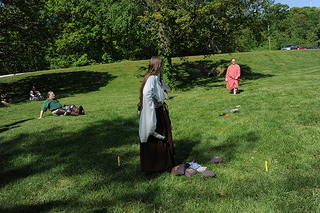 Not only for the participants, but also the spectators. I am looking forward to taking these games on the road, and plan to showcase them at larger events in the near future. 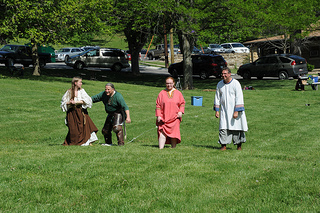 The games are normally played in the order given, so that each participant is able to rest and regroup while playing. This is the only game I did not create, but was there before me. 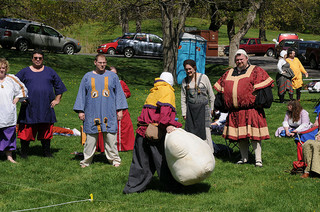 A roughly life-sized sheep, made from canvas and rug remants. Poor Dolly used to have legs and the head has been replaced, until we discovered the approved and safe method of tossing. The aim is throw the sheep as far as possible. 2 points per foot. 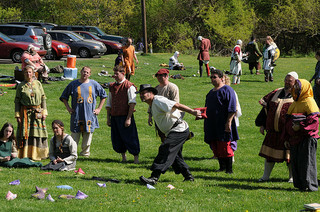 Best score of two throws is taken. The current record is 63'. 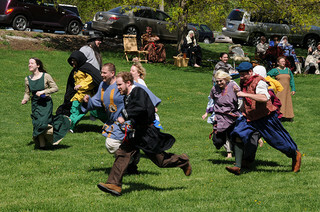 A test of speed: A foot race, where participants run to grab sheep in a field. These sheep are cloth remant-stuffed bags, that are painted with a point value and stamped with a sheep or goat. The sheep are worth a varying point scale, raiders to get their one sheep back over the line, in their possession, by any means necessary. The quickest back are awarded points inverse to the number of contestants. So, if there are 10 contestants, the 1st place across the line adds 10 points to their sheep score, the 2nd across wins 9 points and so forth. Goats are worth a negative point value, as it is a sad raider that can't tell the difference between a sheep and a goat. This game can shift quite dramatically on the fun/brutal scale, as different players take different approaches. Fast runners will try and get there and back as fast as possible, while slow ones tend to attempt to take sheep from the quicker ones. The shaded area is the actual grid. For convenience, the point scores for a horizontal, vertical or diagonal tic-tac-toe are provided. A test of cunning. A field is laid with 4-6 â€œpensâ€� (depending on the number of contestants) each denoted by a small zone around each pen. 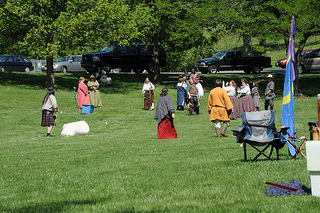 The contestants, one such per pen, begins at the line and races to the center of the field, where a pile of sheep lies. Each contestant must take up their sheep, and race to claim their pen, by dropping the sheep in their pen. Then the contestants may, one at a time, grab sheep (variable point worth) from the field and put them in their pen. Simple? No. For, any shepherd that strays away from their pen may have their pen raided by the other shepherds. Also, there are a small number of goats hidden among the sheep. These are worth negative points, for it is a poor shepherd that canna tell the difference between sheep and goat. Once a goat is captured, it can only be exchanged for a sheep, delivered to someone's pen, or stolen by another. This is a timed 2 minute competition. The Sheep-field. Used both in the Raid & Steal Games. A variant on this is to encourage the contestants to combine into 4-6 man teams. 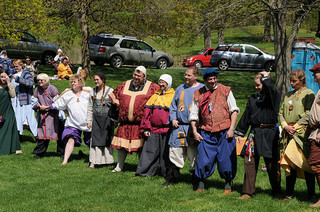 The team with either the highest total or highest average is the winner. This can be combined with an individual winner. 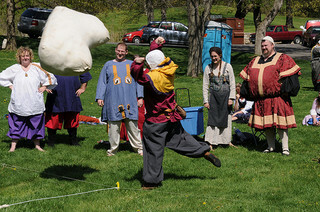 This helps encouragement and fun during the single-person competitions (Sheep Toss & Sheep Darts), and can greatly change the tactics of the group games (Sheep Raid & Sheep Steal). Though the tactics of Sheep Raid in a team setting suggest themselves, let me expound a moment on the group tactis of Sheep Steeling. 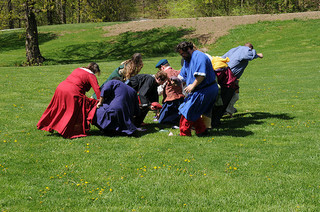 Since this is a competition where teams would only have one player on the field at a time (opposing 3-5 other teams), much can be made of the strategies of which teammate will go up against their various opponents. Closeups of the sheep and goat stamps. The bags are roughly 8" square. I stuffed them first, then applied them to the stamps. After drying, a number was painted on the other side, between 1 and 25. The finished product, showing sheep, goat and a number on the reverse. Photos copyright of their respective owners: M Jameson, Verla Herschell & Vilhelm Lich, all used with permission.